Are you looking to replace your front door? 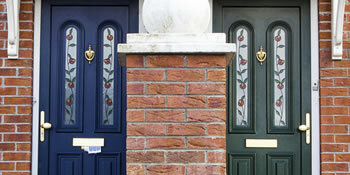 There are many options available to you but none quite as popular as composite doors. But why is this type of door the nation’s favourite and why should you consider it for your own home? There are many reasons to choose a composite door. First of all they look fantastic and there is a wide range of choice in both design and style to choose from. If you want a modern appeal then you can get exactly that, with contemporary designs to go hand in hand with the times. But if you prefer the appeal of traditional front doors, then there are Victorian, Georgian and Edwardian designs to select from. On top of this you can pick a colour that perfectly matches your home. Whether you go for a traditional white or black front door, or would prefer the bold red, blue or green, the ultimate decision is yours. But what about the composite door’s other features? As well as a strong visual appeal, you benefit from excellent insulation and a hardwearing, resistant installation. The construction of the door ensures heat is unable to pass thorough and exit your property, reducing your expensive energy bills. Composite doors are manufactured to resist impacts and the weather too, lasting for decades with virtually no maintenance. A GRP (Glass reinforced plastic) skin helps to protect the front door ensuring it continues to look great for many years to come. Project: Garage conversion and new kitchen almost completed. 2 fire doors required for seperate entrances on ground floor as we have 3 stories. 1 required for existing living room and another for new kitchen. Helped to get companies quoting without having to contact them myself. Sales reps contacted me quickly after you provided information. All in all an efficient process. Pity the job cost was far more than I expected. All companies prices comparable to each other. I need to save more. Properties are given an energy rating based on how efficient they are and ratings are presented in the information below. This varies from A, the most energy efficient, to G, the least efficient. With a higher rating you're more likely to have less expensive energy bills as more heat will be kept in the house. It is possible to improve your home's efficiency with insulation including double glazing, loft lagging or wall cavity insulation. The data below shows the diverse types of homes in Uk. By far the most common homes throughout the United Kingdom are detached and semi-detached houses. Other types of households consist of terraced houses, flats, converted flats and bungalows. The pie chart underneath illustrates the proportion of properties within Uk which are central heated and non-central heated. Central heating figures within the vast majority of UK homes, which includes those on the gas grid and homes heated by oil and electric. The information beneath displays the spread of houses warmed by different fuels. Throughout the UK the most common by far are gas heated properties, followed by electricity and then oil. Biomass central heating boilers are also increasing in popularity, heated by environment friendly products including wood pellets or agricultural waste.|Homes in Britain are heated up by a variety of fuels, such as gas, electricity, oil, solid fuel and LPG boilers. Each fuel has a varying cost associated with it which means you could find yourself with more affordable energy bills by altering the way your home is heated. Even solar thermal panels are being considered by many in order to reduce heating bills for the years to come.